Vessel sink cabinets are popular with homeowners seeking a more contemporary design aesthetic. Although they are relatively inexpensive, vessel sinks and their accompanying vanities are unusual enough to draw attention. 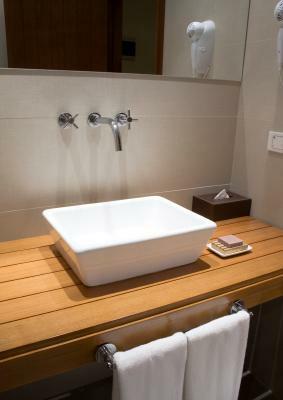 Vessel sink vanities differ from traditional vanities in several key ways. The most practical difference tends to be the height: cabinets for vessel sinks tend to be shorter than traditional vanities. This is to accommodate the exposed depth of the sink, which in a traditional vanity is hidden in the cabinet. If you like a tall vanity, you can choose a wading pool vessel sink to reduce the overall height. The second difference is the appearance of the bathroom cabinet. Vessel sinks are supposed to look like other objects that were appropriated to be used as a sink. Vessel sink vanities follow the same design ethos, often imitating other pieces of furniture. This design aesthetic is further enforced because the sink should appear to be resting on, and not attached to, the cabinet. Some designers will choose a piece of furniture and then modify it to be used as a sink vanity. The third difference between a traditional and vessel sink vanity is the construction of the cabinet. Most vessel sink cabinets do not come with the sink attached. Instead, the top is solid and must be altered to accommodate the sink drain. This feature offers more design flexibility but may also be intimidating for homeowners who want to install the vanity without hiring a professional. The appearance of a vessel sink vanity varies greatly because it is often designed to appear to be something else. Below are several of the most popular items that vessel sink cabinets imitate. A vanity may be as simple as a single shelf that provides counter space and support for the sink. This vanity is preferred in bathrooms where a minimalist design is desired and storage is not needed. The plumbing, including the sink drain, is carefully hidden to avoid damaging the clean lines of the piece. Typically made of wood, it must be treated carefully to avoid water marks and stains. A stool can be used in rustic decor to support a vessel sink and give the entire vanity a haphazard appearance. Usually, this type of vanity is created from a found object that is of an appropriate height. A hole is drilled in the top of the vanity to accommodate the sink drain, and no attempt is made to cover the plumbing. To further the rustic appearance, you may want to use vintage bathroom fixtures. This pairing is meant to mimic traditional wash stands used before running water was common. For traditional bathrooms that require large amounts of storage, a piece that imitates a chest of drawers is often used. The top of this type of vanity is often made of marble and the piece may be finished to appear as though it is an antique. A real chest of drawers can be used, but the top drawer will have to be sacrificed to hide the sink drain. A beloved end table, or a vanity designed to look like an end table, can be used in almost any decor. These cabinets tend to be plain, but have at least one shelf or drawer to add some storage space to your bathroom. Although they are often made of wood, a glass top or a metal base is not uncommon. Vessel sinks are a trend, which may or may not appear dated quickly. If you remodel regularly, this may not be a concern, but if you plan on selling your house within the next five years you may want to choose a different type of bathroom vanity. Do-it-yourselfers with limited experience may also want to avoid vessel sinks due to the additional steps required to install this type of vanity. Not only will the top of the cabinet have to be modified, but you will have to do more plumbing than is required with a traditional sink and vanity combinations, which come preassembled.